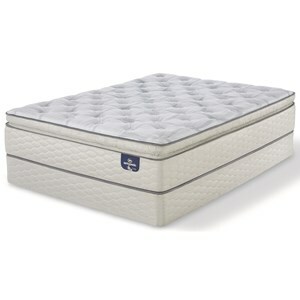 The Carterson Queen Firm Super Pillow Top Mattress and Motion Perfect III Adjustable Base by Serta at Casa Leaders Inc. in the Wilmington, Long Beach, Torrance, Lakewood, Los Angeles area. Product availability may vary. Contact us for the most current availability on this product. Foundation/Box Spring Lift Capacity 850lb. Emergency Power Outage Back Up. Convenient Lay Flat Button. Pre-set Positions Including Zero Gravity. Custom Memory Positions. Ultra Quiet Massage. USB Charging Ports. Wall-Hugger Design. Magnetic Wire Less Remote Storage. Smart Device Control (App Required). Warranty Mattress: 10 Year Limited Warranty. Base: 20 Year Limited Warranty. 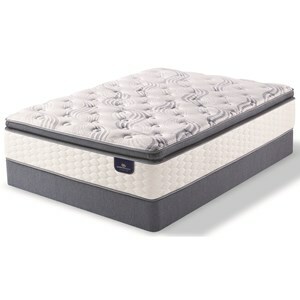 Wake up refreshed after a comfortable and supportive night's sleep with the Serta Alverson Firm Super Pillow Top mattress. The Custom Support™ innerspring system of this mattress features durable and flexible coils made with 20% more steel to help keep everything supported and aligned throughout the night. Cool Twist® Gel Foam and PillowSoft® Aire™ foam promote air flow within the mattress, helping you keep cool, while also providing great cushioning. The Best Edge® Foam Encasement adds edge support to each mattress that helps prevent sagging and edge roll-off that can impact how you sleep. The Carterson collection is a great option if you are looking for Mattresses in the Wilmington, Long Beach, Torrance, Lakewood, Los Angeles area. Browse other items in the Carterson collection from Casa Leaders Inc. in the Wilmington, Long Beach, Torrance, Lakewood, Los Angeles area.